Published January 18, 2011 By Anna T. This post may contain affiliate links. Regardless, I only recommend sites I've researched and/or used and trust. Writer Access is a content site, similar to Textbroker and Content Authority, that hires freelance writers to create content for their clients. 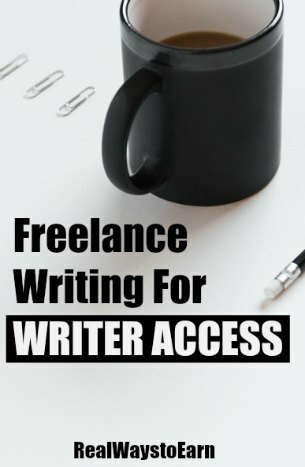 In this Writer Access review, I've done research to find out for you how much they pay, who is qualified, what their writers think of the work, and more. You can earn more money if you strike out on your own and try to find high-paying clients, working for yourself as a freelancer. However, Writer Access and other content sites similar to it may be able to provide you with some immediate income. How much does Writer Access pay? Pay varies according to a writer's level. Once you are hired, Writer Access will determine your writing level, which might be raised or lowered at any time depending on your quality. Levels go from 2 through 5. You can expect a little more here than you can from Textbroker. But anywhere from $5 to $100 per article realistically. What is the method of payment for Writer Access? Payments are made bi-monthly. Writers only get paid if they have at least $10 in their accounts. What does the application process for Writer Access involve? To apply, you have to upload a writing sample (which they won't publish – it's just to check your writing quality), your resume, and fill out some basic information about yourself. You also get the opportunity to fill in a section explaining your interests and why you want to write for their site. In my experience, it doesn't take that long to hear back once you apply. It was less than 24 hours for me, although a review on Glassdoor said it took four weeks. They will email you confirming your acceptance and you can then log in to find out what level you were accepted at. Does Writer Access hire writers outside the United States? No. At this time, Writer Access only accepts U.S. residents. How does writing for Writer Access work? When you log in, you can check to see what jobs are available on the open order board. If there are any available at or below your approved writing level, you can claim them and get right to work. Once your work is submitted, the client has to either accept it or not within three days. Your content will be auto-accepted if the client doesn't review it within that time frame. If you particularly impressed a certain client, the client can add a bonus to your pay if he chooses. They also have something called a “love list” the client can add you to if he or she particularly likes your work. You'll get an email notification if a certain client has jobs up and you are on that client's love list. I did apply and was accepted at level 3. I have yet to do any work for them because there are rarely any jobs available at my approved level. There also seems to be very few jobs available, period. When there are jobs available, it seems they are usually for writers at levels 4 and 5. I have noticed that I get an email that comes in very early each morning, like around 5 a.m., letting me know that jobs were posted and how many. When I log in to check, there is usually nothing there. I don't get up that early, so I'm guessing that other writers beat me to the available jobs. This company has a very high rating on Glassdoor, which is not typical for a content site. Its get a 4.3 out of 5 stars and many of the reviews are from writers who are satisfied with their experiences there. You can go here to check out the reviews for yourself. If you're quick, this might be a good writing job to have. You'll have to stay on top of things and check your email early each morning to find jobs. Maybe in the future they will have enough work available that doing this won't be necessary. Writer Access pays much better than Textbroker or Content Authority and is a similar type of writing site. People who write for them report being paid and on time. I would recommend not depending on just Writer Access for your writing income — the nature of most of these sites is that sometimes there is work available and sometimes there isn't. So you need to be able to spread yourself around. The site looks very professional and I feel it's easy to navigate. You can go here to begin the application process for Writer Access. This is the most profitable route to take as a freelance writer. You can get your own clients and set your own rates, which you cannot really do with a site like Writer Access. A six-figure income is not outside the realm of possibility when you're running your own business. I am employed by WA (Writers Access)and I am here to say that they do not pay as they say-in fact we have to meet all the deadlines and the clients get to take their time paying for our work-even getting additional time to approve orders. It is becoming a problem-although WA will say it is not! We also notice we are not getting paid like it says on the first landing page of the website-that is to entice new writers, and then after your there awhile they pull some tricky stunts! Add time to your orders w/o asking (so they can control the last half of the pay period. They give out two pay dates a month-making us wait tooth and nail for work we completed the month before! If you are looking to get money fast-this is not the site to work for!